One Room Challenge - Week 3: Pump up the Jamb! It's already Week 3 of Calling It Home's One Room Challenge and I'm still trying to figure out how that happened! I have spent many late nights catching up on progress from our featured designers and guest participants and wow - are there ever some amazing spaces! If you just started following my progress so far take a look at Week 1 and Week 2 as well as the reveal for my very first One Room Challenge! 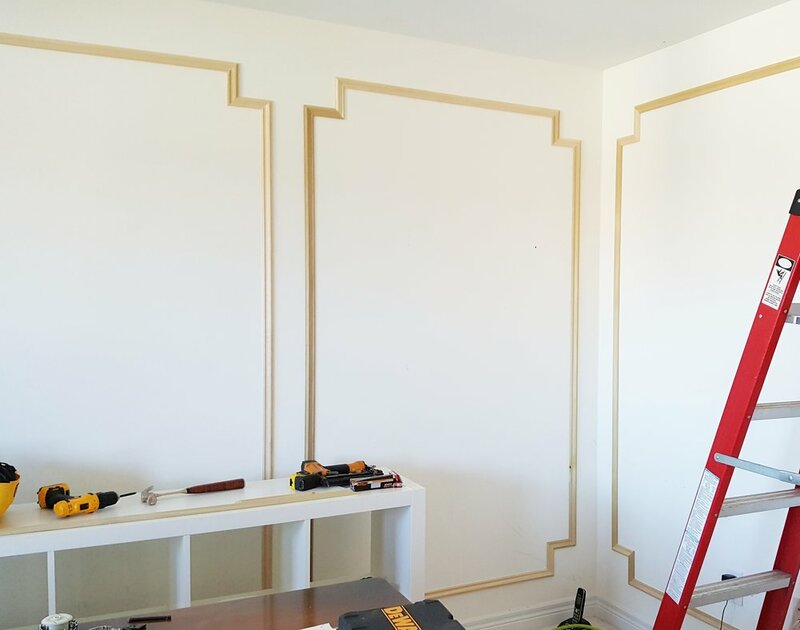 After a trip to Barrie Trim & Mouldings we selected our wall trim and crown moulding. I didn't want anything that was really ornate because this is the only room in the house with wall trim and crown. These mouldings also had to play nicely with the existing doors, casing and baseboard in the room to save on costs. Finally, something that I can do - fill the nail holes and prime! We still have to fill nail pops, caulk the crown and prime and paint everything Benjamin Moore's "Cloud White" but it's looking beautiful and these details makes such a huge difference in the space!